Treasury Minister and Histadrut Chief agree to raise minimum monthly salary by 450 shekels over 17 months. 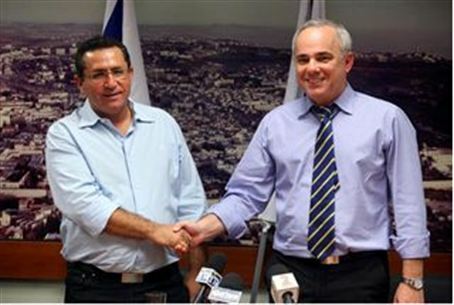 The minimum monthly wage will be raised to 4,300 shekels by October 2012, Treasury Minister Yuval Steinitz and national labor federation (Histadrut) chief Ofer Eini agreed Wednesday. The new wage will be implemented for both private and public sector employees who receive National Insurance Institute "income completion" stipends. The rise will take place in two stages. In July 2011, the minimum wage will climb from the present 3,850 shekels to 4,100 shekels. In October 2012 it will reach 4,300 shekels. The agreement will also affect wages in the public sector, as agreed upon in January this year. Instead of the public sector wages rising by 2% in January 2012 and another 2% in January 2013, the rise in January 2012 will be slightly smaller, at 1.75%, and the rise in 2013 will be correspondingly larger, at 2.25%. The Government will present the Knesset with a bill amending the minimum wage as agreed by both sides.